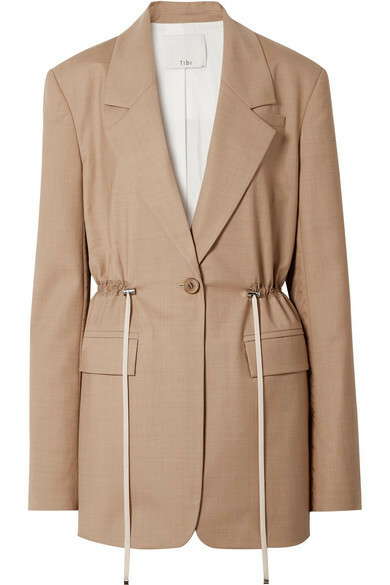 Extremely stylish and comfortable, this pairing of a Tibi tan blazer and white tapered pants delivers variety. White leather wedge pumps will give a more relaxed spin to an otherwise mostly dressed-up outfit. A Tibi ruched canvas blazer and black leather shorts are absolute must-haves if you're picking out a casual wardrobe that matches up to the highest fashion standards. Take a classic approach with the footwear and throw in a pair of tan leather pumps. If you don't like trying too hard combinations, go for a tan blazer and a light blue pleated mini skirt. Take an otherwise everyday ensemble down a whole other path by rocking black leather heeled sandals. Channel your inner fashionista and reach for a Tibi Ruched Canvas Blazer and white flare jeans. A pair of white leather loafers rounds off this look very well. 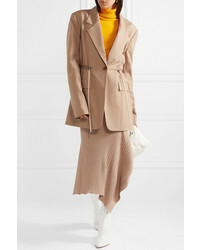 A Tibi ruched canvas blazer and navy dress pants will showcase your sartorial self. Black leather pumps are an easy choice here. If you prefer casual looks, why not marry a tan blazer with navy plaid skinny pants? When it comes to shoes, this outfit is completed nicely with black leather pumps. If you're searching for a casual yet absolutely chic look, team a Tibi ruched canvas blazer with navy and green plaid skinny pants. Both garments are totally comfy and will look fabulous paired together. To bring out the fun side of you, round off your ensemble with black suede ballerina shoes. 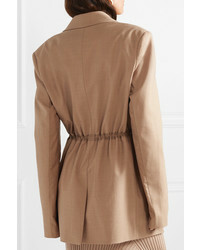 If you're in search of a casual yet chic getup, dress in a Tibi ruched canvas blazer and olive chinos. Both pieces are totally comfy and will look fabulous paired together. Sporting a pair of tan leather pumps is an easy way to add extra flair to your getup. 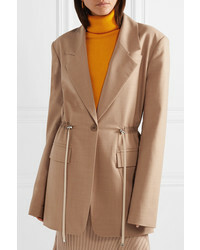 A Tibi Ruched Canvas Blazer from NET-A-PORTER.COM and dark brown jeans are the kind of a fail-safe off-duty outfit that you so desperately need when you have no extra time to dress up. Introduce dark brown suede pumps to the mix to completely jazz up the ensemble.